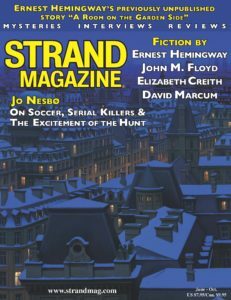 In the tradition of the original Strand Magazine (1891-1950), The Strand features a wide array of stories reminiscent of the Golden Age of crime writing, from cozy whodunits to hard-boiled detective stories, suspenseful thrillers to humorous mysteries, set in a variety of places from Victorian England to turn of the century Prague to modern day England, and written by the leading authors of our day, including Michael Connelly, Jeffery Deaver, Ray Bradbury, Alexander McCall Smith, R.L. Stine, John Mortimer, Faye Kellerman, and Matthew Pearl. We have also published unpublished works by Mark Twain, James M. Cain, Dashiell Hammett, Cornel Woolrich, Agatha Christie, and Graham Greene. A novella about a lost manuscript from a tortured genius and a conspiracy that leads to murder. Mr. George Blake is a kind, distinguished gentleman, with a very unusual hobby…he kills people. A tale of murder set against the backdrop of World War I, by one of the most talented writing duos active today. An aging don can’t trust anyone, he can count on his ruthless skills to manipulate all of those around him, but there is a new wind–which signals the end of the old man’s powers. K.C. Dunbar uses her wits to solve a complex case in rural New Hampshire. What happens when a mystery writers world suddenly involves more crime and intrigue than even he can imagine? A suspicious neighbor, a hound, and a missing spouse make for a thriling-comic mystery. A thrilling tale by the best-selling author of the The Number One Ladies Detective Agency. Hotel and Restaurant guide reviewer Aristide Pamplemousse treats his colleagues to dinner at a Chinese restaurant, where he looks back on a case of a culinary genius who was part of the main course! Leonard gets more than he bargained for when he makes a very generous offer to buy a very interesting painting.